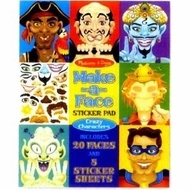 Create different crazy characters with sticker sheets and make it easy to put your best face forward with this fashion-forward sticker pad! An array of facial features and stylin' accessories are at the fingertips of your little designer. Fun for ages 3 years & up.